For the complete report please click here. The Colorado Coalition for the Homeless created the Denver Housing First Collaborative (DHFC) in 2003 with funding provided by a collaboration of federal agencies. The DHFC involved CCH as the lead agency, Denver Department of Human Services (DDHS), Denver Health (DHHA), Arapahoe House, the Mental Health Center of Denver (MHCD) and the Denver VA Medical Center. The DHFC is designed to provide comprehensive housing and supportive services to chronically homeless individuals with disabilities. Initial federal funding created the capacity to house and serve 100 chronically homeless individuals. The program uses a housing first strategy combined with assertive community treatment (ACT) services, providing integrated health, mental health, substance treatment and support services. The housing first approach has been incorporated as a priority strategy into Denver’s Road Home – Denver’s Ten Year Plan to End Homelessness. Denver’s Road Home has provided funding to create a second housing first team at CCH – the 16th Street Housing First Program – to serve an additional 50 chronically homeless individuals. The goals of the DHFC are to increase the residential stability and overall health status of chronically homeless individuals while reducing the utilization and costs of emergency services being provided to chronically homeless persons with taxpayer funds. The Cost Benefit Analysis focused on examining the actual health and emergency service records of a sample of participants of the DHFC for the 24 month period prior to entering the program and the 24 month period after entering the program. Participants provided releases of information for their medical, psychiatric, legal and substance treatment records and associated costs for the four year period. Cost data from the clinical records were analyzed to determine the emergency room, inpatient medical or psychiatric, outpatient medical, Detox services, incarceration, and shelter costs and utilization. The findings document an overall reduction in emergency services costs for the sample group. The total emergency related costs for the sample group declined by 72.95 percent, or nearly $600,000 in the 24 months of participation in the DHFC program compared with the 24 months prior to entry in the program. The total emergency cost savings averaged $31,545 per participant. Utilization of emergency room care, inpatient medical and psychiatric care, detox services, incarceration, and emergency shelter were significantly reduced by participation in the program. Only outpatient health costs increased, as participants were directed to more appropriate and cost effective services by the program. Emergency room visits and costs were reduced by an average of 34.3 percent. Inpatient visits were reduced by 40 percent, while inpatient nights were reduced by 80 percent. Overall inpatient costs were reduced by 66 percent. Detox visits were dramatically reduced by 82 percent, with a average cost savings of $8,732 per person, or 84 percent. Incarceration days and costs were reduced by 76 percent, and emergency shelter costs were reduced by an average of $13,600 per person. If the average cost savings of $31,545 per persons are projected for the 150 chronically homeless individuals currently participating in CCH’s two housing first programs, the total savings would amount to $4.7 million. If these average costs savings are projected each of the 513 chronically homeless persons estimated in Denver who are eligible for the DHFC program, the savings would amount to $16.1 million. When the investment costs of providing comprehensive supportive housing and services through the Housing First Program are factored in, there is a net cost savings of $4,745 per person. Thus, the total net cost savings for the current in the Denver housing first programs are projected to be $711,734. The projected net cost savings for all 513 chronically homeless persons, if provided access housing first programs, would be $2,424,131. In addition to saving taxpayers money, the local and national evaluations of the DHFC program document overall improvement in the health status and residential stability of program participants. For these persons, who averaged nearly 8 years of homelessness each prior to entering the program, 77 percent of those entering the program continue to be housed in the program. More than 80 percent have maintained their housing for 6 months. Fifty percent of participants have documented improvements in their health status, 43% have improved mental health status, 15% have decreased their substance use, and 64% have improved their overall quality of life. In addition, the majority of participants have been assisted to obtain the public benefits for which they are eligible, or to obtain employment. The average monthly income of participants increased from $185 at entry to $431. 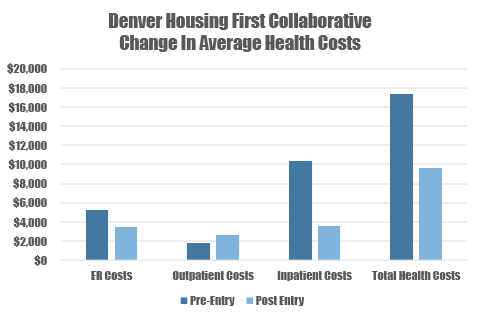 After two years of operation, Denver Housing First Collaborative approach offers tremendous promise of improving the health status of chronically homeless individuals while reducing taxpayer funded emergency costs of emergency room care, hospitalizations, incarceration and detox. Furthermore, the overall quality of life for the community can be significantly improved as the negative impacts of individuals living and sleeping on the streets are reduced.